Casey's designers are second to none. They know how a kitchen should function and will ensure that you get a kitchen design customized to your needs. Casey's takes great pride in their showrooms. Combined, there are over 80 unique designs to give you lots of great ideas. Thousands of satisfied customers over our 30 year history are proof that we get the job done, and done right. 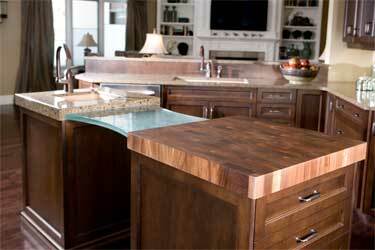 Casey's Creative Kitchens only uses high quality products that you can depend on. Casey's offers a variety of eco-friendly kitchen products, including a 100% water-based finish on our own line of custom cabinetry. We offer a selection of cabinetry that carries a lifetime warranty, which is unheard of in the industry. You know that Casey's stands behind their product, which means that your purchase is worry-free. Casey's uses only professional, experienced tradesmen, so you can let their expertise work for you. Casey's full time service coordinator will make sure your project runs smoothly. They will work with your schedule to get the job done. You can be sure that every time you visit one of our showrooms, someone with kitchen knowledge will be there to answer all of your questions. We take great pride in our people and know that you will get excellent service from all levels of the organization.